CochlearimplantHELP has been reporting on the lack of coverage for bilateral implants for children in Ireland, and following the Happy New Ear Campaign since its inception. 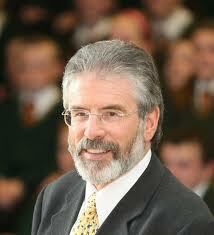 Now Sinn Féin president Gerry Adams lends his support! This entry was posted in Events and tagged bilateral, cochlear implants, Gerry Adams, Ireland, Sinn Féin by CochlearImplantHELP. Bookmark the permalink.